It was a dream come true for hero dog and hero soldier. Thanks to Don Grommet’s personal mission to right a wrong for his son, a hero in the War on Terror, MWD Matty is now at home in Missouri with his battle buddy. 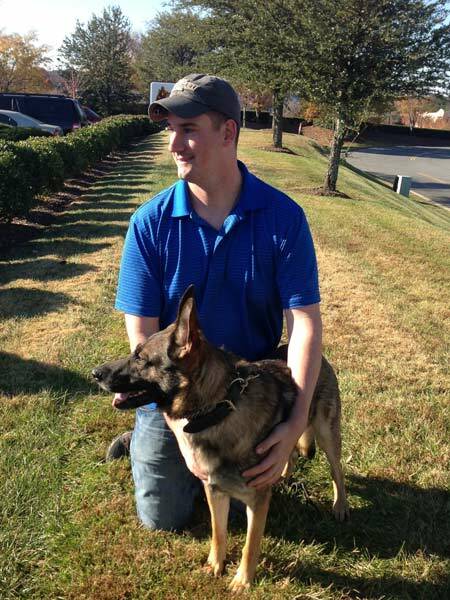 I am so thrilled that Specialist Brent Grommet and his dog Matty have been reunited after more than a year apart. I am also humbled that American Humane Association was able to play a part in making this reunion happen. American Humane has helped numerous warrior dog handlers reunite with their battle buddies, but this reunion is extra special because of all the work and effort that went into it. After working with so many veterans to help them be reunited with the dogs with whom they developed such a close bond, you come to understand just how important and meaningful those relationships are to these men and women. It’s about compassion, caring and healing. Don and I were introduced through the VFW, and I offered the resources to help find his son’s military working dog Matty. His son Brent and Matty went to war together. Then, upon returning to the U.S. after being wounded in an explosion, Brent and Matty were unceremoniously separated. Brent was certain he would be able to reclaim Matty because he had submitted adoption papers. However, due to bureaucratic error and/or negligence, Matty was adopted by another party. We reached out to the local community where the adoption occurred, and made a public announcement making the family who adopted Matty a generous offer to return Matty to Brent. We waited weeks and weeks, and no one called. Thanks to recent media coverage at the national level with Maureen Callahan, Michael Savage and Greta Van Susteren, the family returned Matty to Brent. I had the honor of joining Brent, Matty, Don and Debbie in North Carolina right after they were reunited, where a few tears of joy were shared.